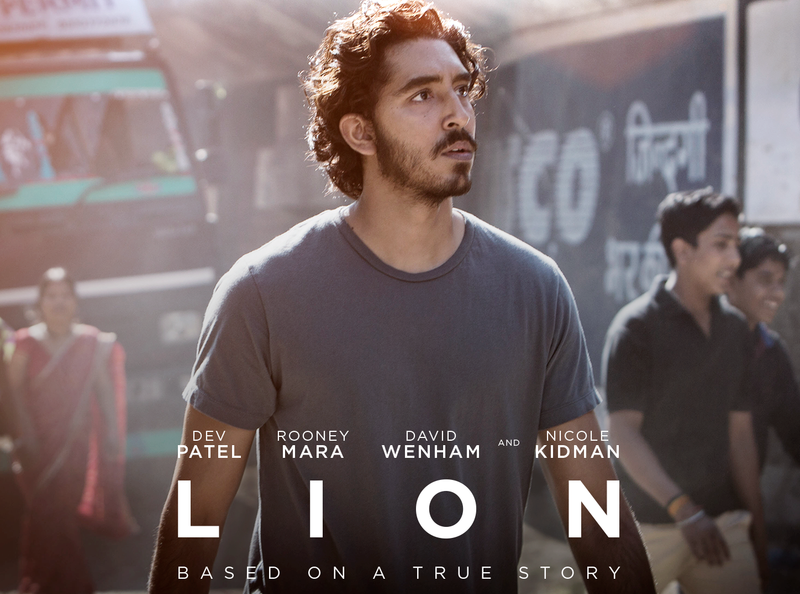 Lion is the true story of an Indian boy adopted by Australian parents , who grew up to search for his long lost biological mother in India decades later. He remembers calling himself as Saroo and his brother as Guddu. Real mother’s name he does not know and he remembers her just as ‘mother’. He remembers stealing coal from freight trains for a living, for his mother was too poor to feed him. His brother was older and they both used to climb the trains together. One day he insists going with his brother on a longer distance journey and his brother leaves him asleep on the platform never to return. What happened to his brother ? It takes a quarter century for him to know the truth. Meanwhile, what happens to him ? Not finding his brother, he takes a train going in the opposite direction of his home to the city of Calcutta. But he is saved from the worst horrors; runs off when child traffickers try to kidnap him among other street children, runs away again when he feels he is going to be trafficked again by a seemingly kindly woman and finally a person takes him to the police. They send him to a children’s home which is not completely safe too, judging from what happens to another child there. But he is selected to be adopted by an Australian couple, played by Nicole Kidman (Sue) and David Wenham (John). These good people have their own quaint reasons for not having their own children and instead adopting them which are later revealed in the film. But when Saroo grows up, he discovers he has not left the baggage of his Indian past; wants to reach out to his origins. I watched his search unfold on screen and it does fill you with real emotion . Of course, the first half of the film (which I have described in short above) once more brought focus on the west’s obsession with the poverty of India. It seems India has to carry the can for all the world’s poverty. Africa may be poorer but the country selected for showcasing poverty is India. Because it is politically incorrect to show African poverty for fear of being labeled racist. Pakistan and Bangladesh have similar poverty, but it is ‘communal’ to show them as poor because both of them have the same religion. China has poverty too, but it is a dictatorship which firmly closes it’s door on foreign media to areas of it which are not worth showing. Only Indians do not mind being denigrated as poverty struck and the west takes full advantage of this attitude. Also , Saroo is everywhere in danger from human traffickers when separated from his brother. Presumably, Indians don’t mind being demonized as traffickers too. The above mentioned dark side of the film is counterbalanced by some great photography. Watch from long distance as only the lights of the train are on as it moves forward in the darkness and watch an even better shot of the train silhouetted against the backdrop of lightening. Emotions are of course the highlight of the film and the film grows more emotional towards the end; does manage to jerk a tear or two out of you at the climax- all the more because it is a true story. Acting by Sunny Pawar (the young Saroo) and Dev Patel (the grown up Saroo) and Nicole Kidman is simply great. Music is good too. So why is the film named ‘Lion’? The reason is revealed in the end. But that is not the only reason why it is worth watching.